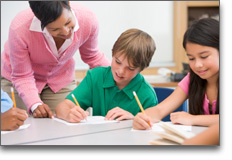 Our centers are committed to teaching and the enrichment of your children’s lives. We know that no parent is ever completely comfortable leaving their children in the care of others, being aware that they are your most precious possessions. We pledge to give each child in our care the best nurturing we can for the time they are with us. We strive to teach them, through programs implemented in our centers, age appropriate skills, such as fine or gross motor skills in our infant through toddler rooms, and all other skills needed for school in our pre-school programs, such as: Reading, basic math, colors, numbers, letters, beginning writing, etc. Our school age programs include help with homework each day so that what is taught in school is followed and reviewed for a better understanding by the students daily. We also teach sharing, social skills, rules, how to follow directions, consequences to actions and taking responsibility, good manners and good hygiene skills through our programs daily. Caring for infants as young as six weeks of age is a tremendous responsibility. We take that responsibility very seriously. We have spent years developing an infant program that is well thought out. Every detail has been meticulously planned from the design of the infant center, to the selection of equipment, toys, curriculum and activities, to the screening and training of infant caregivers. Parents can rely on our loving, dedicated staff of infant caregivers, chosen for their warmth and affectionate personalities. They provide nurturing, age appropriate stimulation and lots of love. 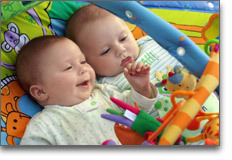 Infant rooms are packed with toys and equipment similar to the toys and equipment you have at home for your baby. Caregivers sit on gliders while holding, cuddling and feeding our little ones. Keeping the infant environment sanitized and disinfected is important and we have put definitive procedures in place to insure cleanliness. Staff is required to adhere to all sanitary measures. Toys and cribs are disinfected nightly. Changing tables are disinfected after each individual diaper is changed. Diapers are placed in plastic bags before being deposited in a lined diaper pail which is emptied several times a day. Each baby has his or her own crib. Cribs are NEVER shared. Nightly reports are ready for parents at pick-up time. They reflect in detail, everything that went on during the day, including new and exciting developments, diaper changes and feedings. These reports, known as Baby Talk are invaluable to busy parents. Toddlers are striving for independence and have reached a child's first real milestone. They have grown into the mobile stage and are walking and exploring their fascinating environment. Their curiosity is endless. Toddler rooms are designed to be self-contained, with a diaper changing station, and potty training bathroom. There are plenty of toys, equipment, art supplies, blocks and books. There is always lots of love given to all by our Toddler staff. Since Toddlers learn through play and exploration, we give them the space, age appropriate materials and stimulation they need to help quench their thirst for exploration. 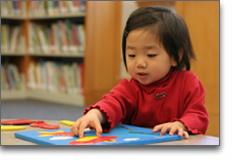 Our weekly curriculum, gives our Toddlers valuable experiences to help them develop and learn. At this stage, we focus on eye hand coordination, motor development and problem solving. The Toddlers' natural inquisitiveness is encouraged and nurtured. The Toddler staff strives to ensure a safe, secure, loving environment. Once a child is mature enough to handle "potty time" by himself/herself, and the staff and parents believe the child is socially, physically, and emotionally ready to move to the next classroom environment, the child will enter our Potty Program. This program, designed to meet the special needs of maturing twos and young threes, is a perfect bridge into our Preschool classroom. Teachers in this class are prepared for “potty accidents”. Daily communication reports, are ready at the end of the day for busy parents to pick-up. These easy to read reports reflect everything that went on in child's day. Our Pre-school Daycare program is fun and learning. The ultimate goal is to prepare your child to successfully enter kindergarten in two years, and to become a successful lifetime learner. In the short term, our Preschool teachers are focusing on preparing your child for the next level of curriculum, which is Pre-Kindergarten. Your child will acquire a full breadth of developmental skills necessary, to successfully enter kindergarten eager and ready to learn. How exciting is it when your child is ready for one of the biggest steps he or she will take? Entering kindergarten! Selecting the appropriate Kindergarten environment is important. At our Little People Day Care School (Allentown), we offer a State Department of Education certified kindergarten program. Our comprehensive program gives each child the opportunity to learn from a variety of developmentally appropriate materials and equipment . 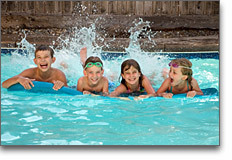 The curriculum is designed to enhance each child’s self-confidence and to build each child’s self-esteem. It gives the children the opportunity for optimum growth in academics, socialization, physical fitness, and emotional well being. Our Pembroke Pee Wee (Bethlehem) and Gentle Care (Catasauqua) centers offer transportation to all local school's kindergarten classes, and transportation back to our centers. Children brought back to our center, will continue a curriculum throughout the day. For school age children in our before and or after care programs, full day childcare is provided on all seasonal vacations such as: Christmas break, Easter break, and other major Holidays, as well In-Service days. Fun activities like roller skating and bowling are provided free of charge. 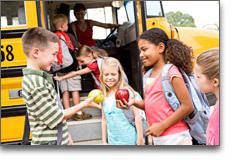 Drop your child off at any of our centers, after 6:00 am and he or she will receive a full balanced breakfast. At the proper time he or she will be driven to their appropriate schools. 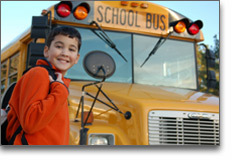 We safely bus all school age children to all local school. A typical afternoon in our after school age program begins with Physical Activity time, where the children can burn off energy and enjoy the social interactions that play offers. Home work aids are also available for those children who prefer to complete their home-work before returning home. Dinner is served to all our children before departing for home. Need help paying for child care? Consider applying for subsidized child care. The subsidized child care program helps low-income families pay their child care fees. The state and federal governments fund this program, which is managed by the Child Care Information Services (CCIS) located in your county. 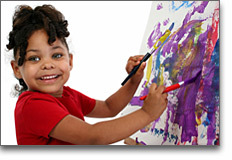 • The CCIS will pay a part of your child care fee (called a subsidy payment). 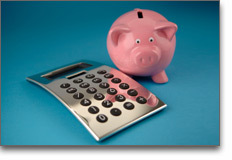 • You will pay a part of the fee (called a family co-pay).